Verizon Galaxy Tab Price Drop to $499 | Android Blast! The Galaxy Tab from Verizon has just had its price dropped from $599 to $499, and the best part is it's an off contract price. That means you don't have to commit to a 1 or 2 year contract just to get the hottest Android tablet around. If you want to take advantage of the new pricing head on down to your local Best Buy to pick one up. You will still have to sign up for the first month of service, but after that you can cancel and use it how you see fit. 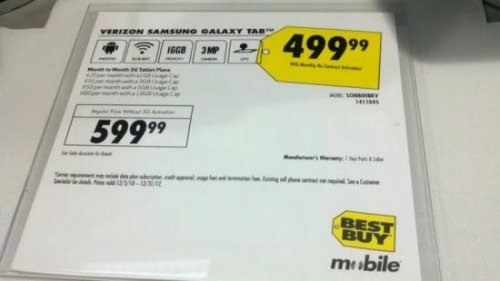 At $499 the Galaxy Tab is in the iPad's neighborhood, but we'd still like to see further price reductions. $500 is a bit pricey for a 7" tablet.